Beautiful clusters of Rhododendron flowers. Actually quite exotic looking. So it’s all happening hard and fast outdoors now in Nova Scotia. Part of me wishes it would just slow down a bit. Before we know it we’ll be in the dog days of summer and then September. Or so it seems. 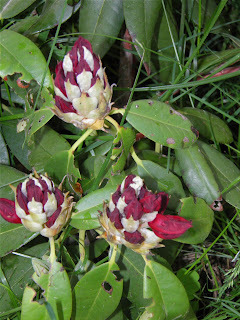 A red variety, just starting to open. There’s a lot of herbaceous perennials bolting skyward in the flower beds, but today I’d like to show you something a bit more structural. Rhododendrons. They’re those magnificent bushes that have huge pom-pom style heads of blossoms as Spring reached its apex. They can form part of the bones necessary to ensure you garden has 4 season enjoyment. They also do not loose their leaves in our USDA zone (Zone 5-6). Rhododendrons come in almost all colours: pink, rose, deep red, apple blossom, creamy yellow, soft blue… Usually if you want the more fiery colours (like orange) you’ll need to resort to azaleas but I’l sure someone’s working on them. Rhododendrons set their blooms for the following Spring in the Autumn so it’s easy to see what your ratio of bloom to new growth will be. Rhododendrons (from the Greek rhódon (rose) and déndron (tree) are a genus of over 1000 different species. They are all members of the heath family and also include what we call azaleas. All are members of the heather family, which are plants fond of acidic soil, and include cranberries, blueberries and huckleberries among its members. 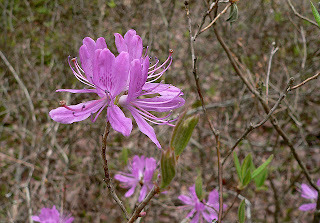 Rhododendron canadense, our native rhodo. Rhodos range from the very small to the very large depending on the variety. Before Halifax was hit by Hurricane Juan in 2003 the Victorian Public Gardens boasted some magnificent showy specimens, some approaching 20-25 feet high by at least as wide. Sadly they are now quite reduced from what they were. They were mostly growing quite close to the front gates which lost almost all its surrounding trees causing considerable damage to the plants underneath. Rhodos as a species is quite diverse. They range from small Alpine varieties to ones almost 100 feet high. 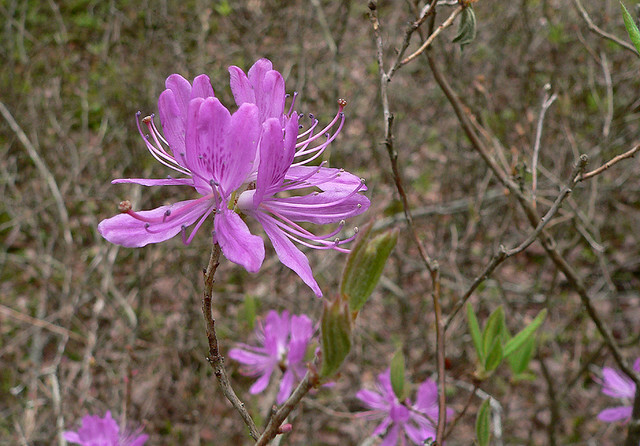 Eastern Canada and the USA (including Nova Scotia) is home to one of the wild ones – rhododendron canadense. In Spring (right now actually) it produces sparse, spindly purply-pink flowers on sort of sad looking bushes in ditches. As you can tell, I’m no great admirer, but many poets were, including Ralph Waldo Emerson. One of the Rhodos at the Public Gardens, Halifax. 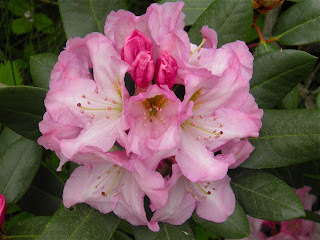 Rhododendrons have been noted by historians (usually in an unfortunate way because they are poison) since ancient times. They flourish on every continent north of the equator, although there are some exceptions south of that point as well. Rhododendrons were first classified by a Flemish botanist in the 1500s and soon after started their way into cultivation. Cultivated Rhodos followed Europeans to the New World and established themselves in North America as a subject for horticultural improvement. 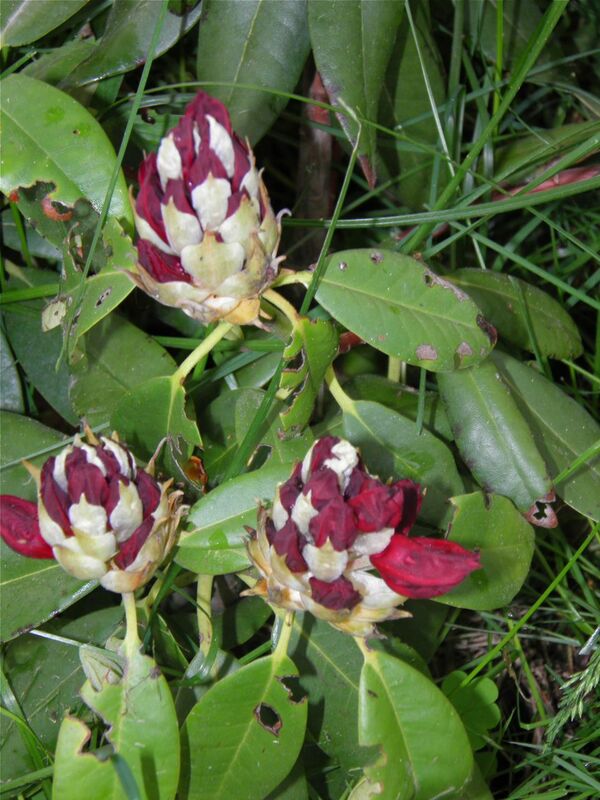 This is not to say that there were not species of wild Rhodos already present in North America. They just weren’t “decorative” enough for our liking. at breeding for a true red. Beautiful none the less. Cultivars of Rhododendrons are almost too numerous to count. They are continually being bred for increased hardiness and better, bigger flowers. One Nova Scotia breeder, Captain Richard Steele (1915-2010),was inducted into the Order of Canada in 2004 for his outstanding contributions to horticulture in our country. I have mentioned his garden centre Bayport Plant Farm in Rose Bay, Lunenburg County (on Highway 332) in a previous post. I was fortunate enough to have bought Rhodos from Captain Steele. One is actually in full bloom right now. It wasn’t in the most ideal spot, but it’s settled in quite nicely. Rhodos do like their acidity. One simple way to do this is to top dress the soil around the trunk with pine needles. As they decompose they release elements into the soil underneath them which changes the pH to slightly acidic. They will reward you with more vigorous growth and better bloom set. They like some sun, but do not require full day exposure. Partial shade will suite them just fine. Never plant a rhododendron or azalea too deeply. The root ball should be level with, or even slightly above, ground level. Also either check, or know, what your soil pH actually is so you give your new plant the best opportunity to flourish. 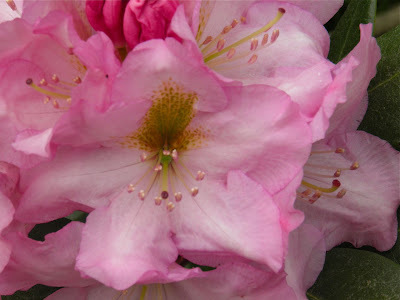 If you feel the urge to prune your Rhodo don’t do it until you visit marthastewart.com. 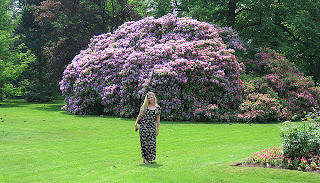 A few years ago she had a great article in Living about how and when to prune Rhododendrons. It should be available to read on her website. 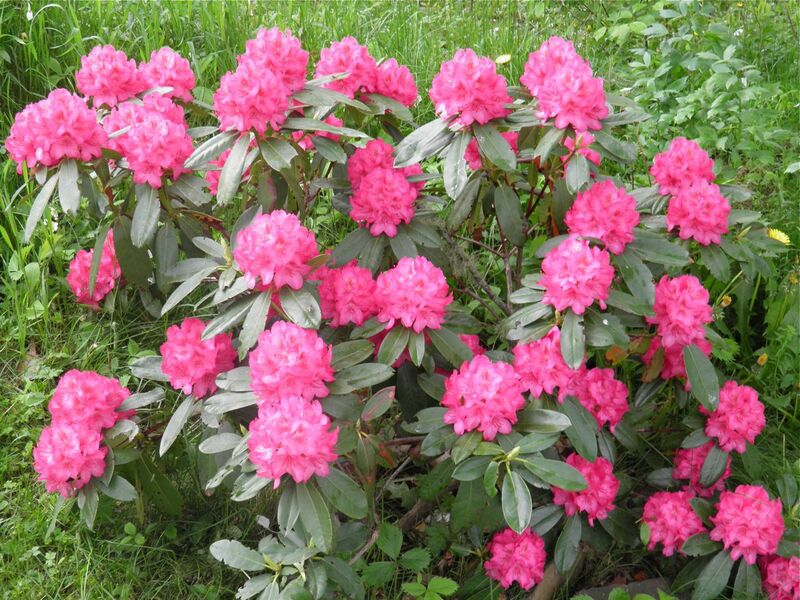 I hope you either own, or are willing to try, to grow a Rhododendron. They are a beautiful thing to behold in full bloom. You can purchase rather large pot-grown ones are (fairly) reasonable prices, but even a small one gives you something to hope for in the future. And if there's one thing all of us can appreciate, it is doing whatever we can do to hope for a better tomorrow.